CNN host Michael Smerconish did his best to diminish the House Select Committee investigating Benghazi during an appearance on ABC's This Week with George Stephanopoulos on Sunday, May 11. The hearing I would like to hear, the hearing I’d like to hear is the hearing that says what became of those individuals responsible for the deaths of four Americans and why haven’t we brought them to justice? Not a hearing about e-mails and Ben Rhodes and what did he know and when did he know it. Smerconish's comments came after Congressman Adam Kinzinger (R-IL) lamented how as a result of Secretary of State Hillary Clinton's tenure "I can’t throw a dart board at a world map now and hit within 100 miles of a place where there’s either a war or an ally that no longer trusts us. And so I think that’s going to be a much bigger issue if Hillary decides to take the plunge in 2016." 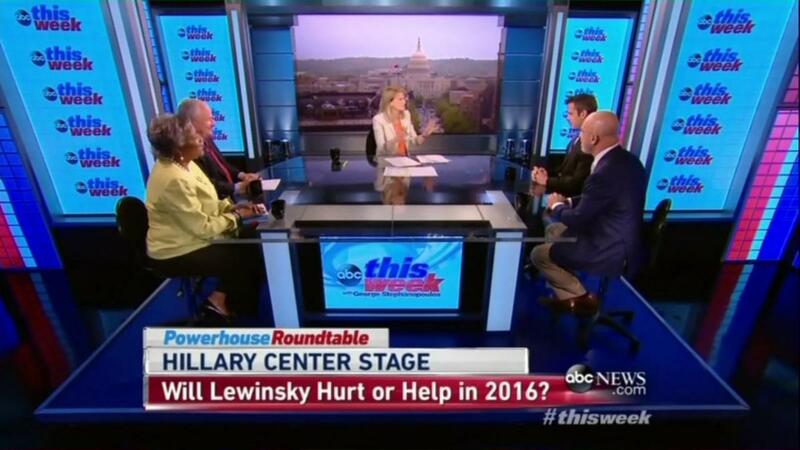 MICHAEL SMERCONISH: I think the net net is a zero or a slight plus for Secretary Clinton. MARTHA RADDATZ: I was going to ask that Is there any plus in this for her? SMERCONISH: It I think portrays her as a sympathetic figure. I mean it reminded me of all that she had to endure. I can’t imagine Martha that there’s someone in this country who says well I was going to cast a ballot for Secretary Clinton in 2016 but now I’m not going to do so because her husband cheated on her. I think it’s also a sign of her resilience because I read that portrayal and it reminded me, my God, like her or dislike her, Hillary’s been through a heck of a lot and she’s still standing. RADDATZ: Congressman, you’re the youngest person here, okay, I think maybe by far. So you’re younger than Monica Lewinsky. Isn’t that terrifying to think that? So your generation, does this just pass, people don’t care? ADAM KINZINGER: Well, I don’t think the Lewinsky thing is going to matter, I mean it’s more of an intriguing story now. I feel bad, a little bit, for her. I mean, she was young when this happened. And obviously everybody knows her name and not for something she necessarily wants to be known for. But the bigger issue on the Hillary question, I don’t think this is going to really effect Hilary. The thing that’s really going to be bad is that I can’t throw a dart board at a world map now and hit within 100 miles of a place where there’s either a war or an ally that no longer trusts us. And so I think that’s going to be a much bigger issue if Hillary decides to take the plunge in 2016. RADDATZ: So you’re saying her history as Secretary of State and of course Benghazi came up again this week and we’ll have the committee investigating that. KINZINGER: Yeah I think those are going to be bigger issues than Monica Lewinsky. RADDATZ: You mean as an issue? SMERCONISH: Get out the vote. But to get out what vote to get out the vote of the GOP base. The hearing I would like to hear, the hearing I’d like to hear is the hearing that says what became of those individuals responsible for the deaths of four Americans and why haven’t we brought them to justice? Not a hearing about e-mails and Ben Rhodes and what did he know and when did he know it.